There’s nothing quite like riding down the open road on a motorcycle, as any biker can attest. There is, however, a trade-off for the thrill of riding a motorcycle. In exchange for one of the most exhilarating experiences a person can have, the biker puts himself or herself at greater risk of bodily harm in the event of a collision or other accident. This is a risk that most bikers fully understand and find acceptable. 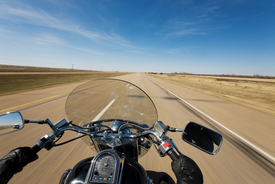 However, too many motorcycle accidents are simply out of the hands of bikers. No matter how safe and vigilant they are, they are also at the mercy of other motorists on the road, as well as road defects and adverse weather conditions. Sadly, motorcyclists are at inherently greater risk for accidents, not because of their own actions, but because of the actions of others. When a person has been involved in a motorcycle accident through no or minimal fault of his or her own, the Los Angeles personal injury attorneys of the Law Offices of Edward Deason can help. Edward Deason can evaluate the motorcycle accident case and explain the legal rights and options available to victims and their families. He can also represent victims in filing a claim against the negligent party or parties to ensure that victims’ rights are protected and that they are able to receive the full measure of damages to which they are entitled. Don’t hesitate; all personal injury cases are governed by time limits called statutes of limitations. Edward Deason encourages motorcycle accident victims and their families to arrange for a case evaluation with Los Angeles motorcycle accident attorney Edward Deason today. Simply contact the Law Offices of Edward Deason in L.A. The Los Angeles auto accident attorneys of the Law Offices of Edward Deason handle the full range of motorcycle accident cases, regardless of their causes. Attorneys will work to present a strong, compelling case by showing that the responsible party was either exclusively or primarily at fault for the injuries sustained by the victim. Those that have been seriously injured in a motorcycle accident should not hesitate to contact the Los Angeles personal injury lawyers of the Law Offices of Edward Deason today.